Fotomoto | How do I install Fotomoto on Pixelpost? Please note that because Pixelpost is an open source application and templates are customizable, we can't promise that Fotomoto will work with every available template. That said, Fotomoto should work nicely with most "default" templates. To install Fotomoto on your Pixelpost site, first make sure you have your Pixelpost plugin and Fotomoto Site Key, both of which can be found on the Settings page of the Fotomoto Dashboard when you have selected Pixelpost under Publishing Platform. Copy the Fotomoto add-on, Fotomoto.php, to the root/pixelpost/addons directory on your server. 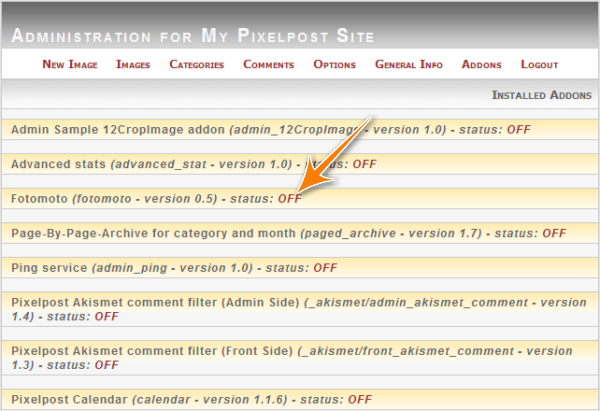 In the Pixelpost Admin menu click Addons from the navigation bar, then activate the plugin by clicking on the OFF link found next to the Fotomoto addon (make sure the link says ON). 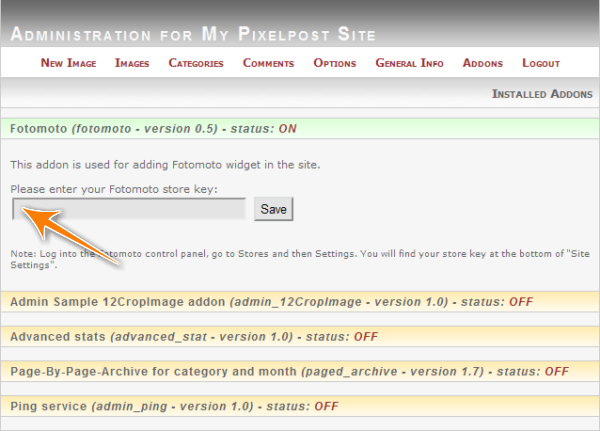 Copy and paste in your Fotomoto Site Key into the Fotomoto store key field. Your Pixelpost site should now have the Fotomoto Buy Buttons added under each image.